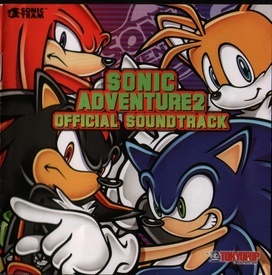 Sonic Adventure 2 Official Soundtrack is the western-released soundtrack for the Sega Dreamcast game of the same name. It is the first Sonic-related album to be issued in the United States since 1996's Virtual Sonic, and the track list serves to be more of a "best of" offering than the lavish Japanese soundtracks. Containing the eight themes from Cuts Unleashed SA2 Vocal Collection, the remaining eighteen tracks come from Multi-dimensional Sonic Adventure 2 Original Sound Track, leaving 40 songs from that release on the cutting room floor. This page was last edited on 29 December 2018, at 23:19.